Time to bite the bullet and write about something that's been on my mind for a while. Marathon training finished long ago, and I'm back in the gym. There's no excuses for me now. "What's grinding my gears?" I hear you asking. Ethnic diversity within the fitness industry and sports. I have seen many articles and campaigns encouraging women to participate in sports, and whilst that has been a success overall, I feel that the encouragement of women, across all ethnicities, in the sports and fitness industry has been long neglected. I received my gazillionth BodyPower invitation the other day. A number of blonde and brunette haired, lean women were on the leaflet. All were going to be present at the weekend-long event. All were white. Scroll through the confirmed athlete's section of BodyPower for a much better flavour. The ethnicities present across both genders is, in my view, quite reflective of the presence of skin colour across the industry. There is a problem among both genders, but among women is where the problem is more prevalent. Take a look at the Confirmed Athletes' section on the BodyPower website. There was only one non-white female athlete: Gauri Chopra (an absolute instagram fitspo, by the by). All the other women are white. Note, in this post I'm referring to brown and other south-east asian for non-white. There is more of an ethnic mixture amongst the male athletes, with plenty of black athletes. But, no brown athletes. I don't want to pick on BodyPower but that is the most recent example I found. For a daily basis, I have found that the media and brands barely pick up on ethnic diversity in their campaigns. Sure, there are black models. Yet having black and white models in a campaign doesn't make it suddenly diverse. Excuse the pun, but, it's not a black and white picture. Brands and campaigns need to put models, from other backgrounds, to make it diverse. Look at Active In Style's website. All the models are white. Look at Adidas' campaigns. The models are black or white. Where are the brownies (term used endearingly)? Look at Reebok's campaigns. No blacks or brownies. Where are they? A model's skin colour can itself draw in buyers of a similar skin colour, because they see themselves in the model. Correct me if I'm wrong. Again, I'm picking these two brands because most people know them but it's the same with other sportswear brands, like onzie. The This Girl Can campaign is perhaps one of my favourite fitness campaigns to date, yet with the huge number of women they used, barely any were brown. Fitness in the Asian community is very old-school and the further north you travel in England, the more prevalent the problem exists. Men are congratulated for exercising, eating lots of meat and having stacks of whey. Women, on the other hand, are not given the thumbs up to exercise. I have an 11 year-old cousin who loves sports, yet in her area, the only existing sports activities are for boys. Girls are apparently not interested in it. I'll always remember one occasion when I was working out in a park, up north, and a stranger apparently took a photo of me mid-burpee (attractive!). The photo found its way across the town, when my aunt received it, not knowing it was me. She looked at the photo, realised it was of me, and told me people had been gossiping about me, saying a woman shouldn't be exercising, or even doing it outdoors. It was the most ludicrous thing I had heard. So yes, a part of the problem is the Asian community's attitude towards women and exercise. Heck, when people come over to my house and see my stacks of whey, they assume it's for my brother rather than for me. "My son uses that, why do you need that?" I digress so back to earlier. I was disappointed with the real lack of diversity in the This Girl Campaign. Yes there was only one brown woman (that I remember) in the campaign, only one. Even then, I barely saw it compared to the other This Girl Can images. Plenty of scarf-wearing women will hopefully be encouraged to take up sport with that image. And I applaud that. 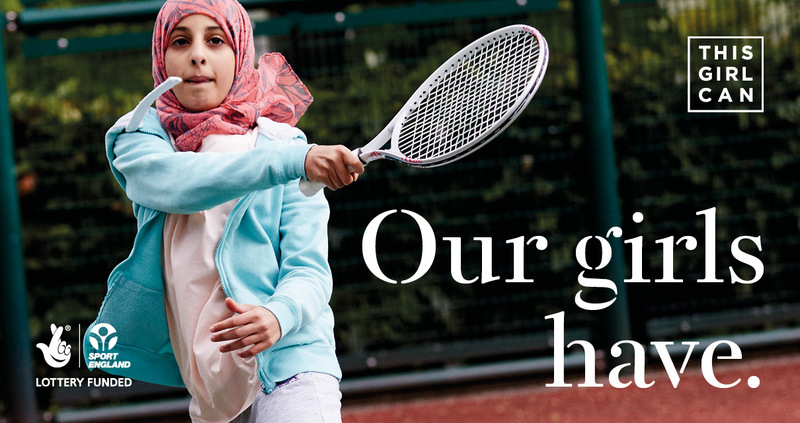 Asians and particularly female, Asian Muslims, don't really take up sport. For example, I was one of a handful of brown runners during the Hamburg Marathon, and I only saw one scarf-wearing runner throughout the entire course. I'll admit I'm quite a coconut (brown on the outside, white on the inside), but unless you wear a scarf, do you relate to the image? The campaign needs more brown women. If I was starting my fitness journey right now, I wouldn't relate to her. The lack of ethnic diversity in sports is partly a problem both at grass roots level and above. A football study in 2014 showed that black and ethnic minority (BME) coaches weren't getting top coaching jobs. But then even then, I feel that the term BME shouldn't exist because it is grouping together everyone who isn't white. My assumption is that if we were to break down the figures in the study, there were probably more black coaches than Asian coaches. Let me tell you why I think black and ethnic minorities shouldn't be grouped together under the umbrella term BME. There are significantly more Asians than there are black people in Great Britain. The problems each face differ too. For example, when it comes to sports participation, across both genders, black people generally are much more active than other ethnic minorities, like Asians. Part of that is because it is so engrained in their culture; In Ethiopia and Kenya, runners are considered role models and running is a huge part of the cultures. Look at Team GB athletes: Mo Farah, Nicola Adams, Perri Shakes-Drayton, Tseigai Tewelda are just a handful of BME athletes who have represented our country. They are all black. Team GB for the 2012 Olympic Games should have reflected a modern Great Britain. But, it didn't. The only Asians who participated in the olympics are Amir Khan and Jawaid Khaliq. Ruqsana Begum is the only female Asian athlete I can think of, who has represented Great Britain. Going back to what I said earlier, part of this is a grass roots problem. I often hear discussions about encouraging more people from state school education to get into sports. Yet, rarely do I hear about trying to encourage more women and men, from various ethnicities to get into sports. Money and time needs to be invested in this. The only sports that don't seem to struggle with attracting Asians (particularly men), are boxing and cricket. That's partly down to culture. There is still a long way to encourage women to get into those sports too. Integration is an issue as to why there seems to be a barrier in women accessing and participating sports. I feel that Asians are partly to blame. Again, the further north of England you go, the less integrated Asians are (generally speaking). They usually socialise only with fellow Asians, and it becomes hard for them to interact with non-Asians when they are older, at university and work. This is something I have noticed myself, being brown and having a lot of family ( and I really mean a lot) scattered across north England. Do you think there is a real lack of ethnic diversity in sports where you are? What do you think about the lack of brown fitness models across activewear and fitness-related campaigns? How should we address the problem and what are the solutions? I would love to hear your thoughts. Write a comment below or tweet me.